Growing boys team in a brand new 16, 600 sq ft facility is looking for an energetic and self-motivated boys team coach to assist the boys team head coach with a team of 30+ boys, Levels 4 -10, JD and JE, and possibly assist with a 3rd year T&T team that is growing to about 15 members, Level 2 - 6. CEG is located in State College, PA, home of Penn State University- a fun and kid friendly town that has been voted one of the top places to live in PA. Position can be full time (with other responsibilities including class coaching and gym upkeep) or part-time evenings and Sunday afternoons. Full time coaches are eligible for health care benefits and paid vacation. Interested candidates should send their resume and brief bio including gymnastics and coaching experience to tracy@centreelitgym.com. Position will be open in May 2019, but start time can be somewhat flexible until July 2019. All summer classes will be held in our NEW facility located at 177 Champions Drive, State College, PA! New Adult Fitness Schedule @ New Gym! Centre Elite Fitness held our first Adult Fitness classes in the new gym this week! A revised workout schedule for our live and pre-scheduled virtual classes has been made to accommodate the move to the new building. In addition to the live instructed classes, the new dedicated fitness room will be available throughout the day for Virtual Classes so you can pick your workouts on your schedule! We look forward to seeing everyone in the gym! After just 7 days it is starting to look like a gym! 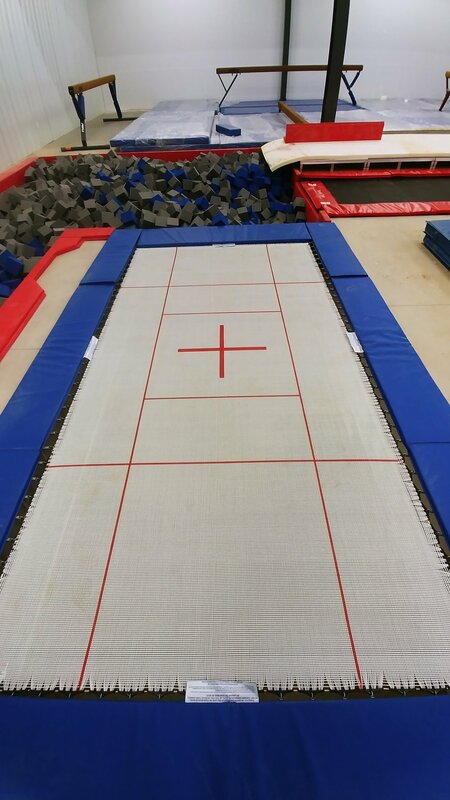 In ground trampoline, tumble trak and foam pit have been installed. Centre Elite Gymnastics will be opening at 3:30 PM today, Thursday, February 21, 2019. All morning Open Gyms, Preschool Classes and KinderGym are cancelled for today. We will have a make-up for these missed classes and KinderGym on Thursday, June 6. All Thursday evening classes and practices will be help at their regular times. Due to the pending snow and ice forecasted for today, February 20, 2019, Centre Elite Gymnastics will be closed for all Open Gyms, KinderGym, Preschool Gymnastics, Recreational Gymnastics, Tumbling, and Adult Fitness Classes. Information on a make-up for these classes will be provided once it has been scheduled. We hope you all stay safe during the storm and we look forward to seeing you at the gym soon! Centre Elite began the laborious task of moving some of our new equipment into our brand new home this weekend! While we will continue to hold classes in our current facility through the end of the school year, we are excited to show our families what is coming! As we continue to move equipment we will post updates on the status of the new gym so you can share in our excitement! New Custom Mats For Our New Stall Bar Area!! Brand New Floor Exercise & Tumble Strip Are Ready For Carpet! Centre Elite will open at 10:15 am today, Wednesday, February 13, 2019. KinderGym will run from 10:15 am to 1:15 pm. If your child attends Wednesday KinderGym, please make sure to send them in with a lunch today. All other classes will run at their normally scheduled times. Due to the ice , snow and freezing rain in the forecast for this afternoon and evening, Centre Elite will be cancelling all classes and team practices tonight, Tuesday, Febuary 12, 2019. The make-up date for both the AM and PM Classes will be Tuesday, June 4, 2019. Due to the possibility of accumulating ice during the late morning hours, Centre Elite will be closed for KinderGym, morning classes and preschool open gym. A decision about the status of the afternoon classes will be made by 2:30 PM. Please continue to check your email, facebook or our website for updated information. Due to the forecasted winter weather for this evening, Centre Elite will be cancelling all classes that begin at or after 6 pm. The 6:30 pm Advanced Preschool, 6:15 pm Girls Level 1AB, Boys Developmental and ART WILL NOT be held this evening, Monday, February 11, 2019. Classes that are scheduled to begin prior to 6 pm WILL RUN as normally scheduled. Make-ups for the 4 cancelled classes will be scheduled and additional information will be passed along once the make-up date has been selected. Please stay safe during the coming storm! Construction Update- New Home of Centre Elite! 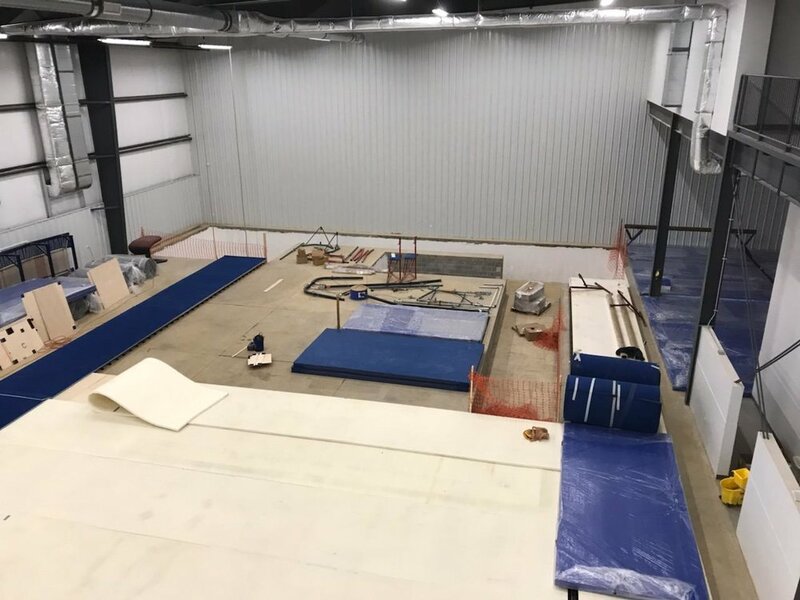 Construction on the new home of Centre Elite Gymnastics is nearing the finish line! Here are some pictures of the new space- and our team coaches, class instructors and office staff cannot wait for you to see it finished! Centre Elite will be opening today (Tuesday, January 22, 2019) at 10:15am. *KinderGym will run from 10:15 - 1:15. If your child attends Tuesday KinderGym, please remember to send a lunch! *There is no Pre-School Open Gym at 9:15am. *All other Tuesday classes and Open Gyms will run per the normal schedule! Due to inclement weather, CEG will open at 10:15am today. *KinderGym will run from 10:15am-1:15pm. If your child is enrolled in Tuesday KinderGym, please send them with a lunch today. *There will be no 9:15 PS Open Gym. *All other classes will run per the normal schedule. Centre Elite Gymnastics will be opening at 11:00am today, Friday, November 16, 2018. The 11:00am Preschool Class will run as regularly scheduled and we will offer a special Preschool Open Gym from 11am-12pm. A special All Age Open Gym will run from 12:15pm to 1:45pm. The Friday Night Open Gym will run as regularly scheduled. The 9:15am Preschool Open Gym has been cancelled. Due to the forecasted snow and ice accumulation for this afternoon, Centre Elite Gymnastics will be closing at 12:30pm today, Thursday, November 15 2018. All Preschool Classes, Gymnastics Classes, Tumbling Classes, Adult Fitness Classes and Team Practices have been cancelled. Please stay warm and safe in this inclement weather! KinderGym will NOT be running. ToddlerTime will run as normally scheduled from 9:30am- 10:15am. We are adding a Pre-School Open Gym from 9:30am- 10:30am. The 10:30am Preschool Class will run as normally scheduled*. The 11:30am Preschool Class will run as normally scheduled*. *If you do not feel safe traveling in the winter weather we invite you to schedule a make-up class in lieu of this mornings class. Centre Elite Staff will be monitoring the weather during the day and will provide additional information on the evening class schedule between 2:00pm and 2:30pm so please be on the lookout! This information will be sent out via email, posted on our facebook page and online here.